Click for more market data. Fear has returned to Wall Street. Just days after hitting new highs, stocks fell across the board Thursday as the bears came out from hibernation. The Dow Jones industrial average ended the day down nearly 170 points, though the blue-chip average lost more than 200 points earlier in the day. 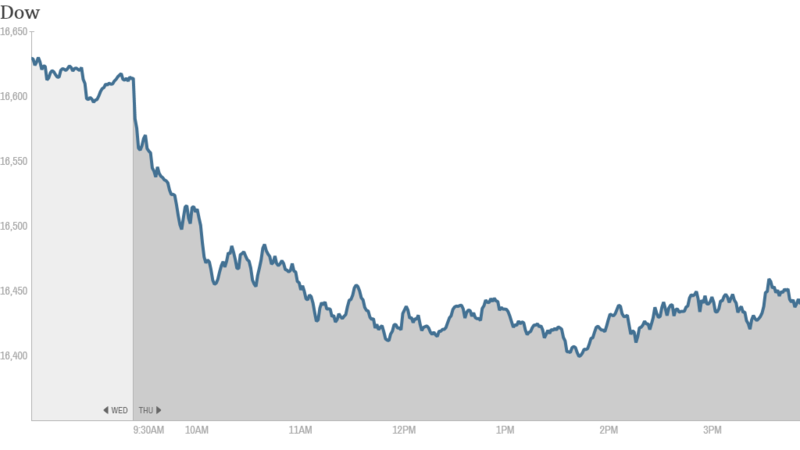 The S&P 500 and the Nasdaq both fell hard as well, with the S&P 500 close to a percent drop. Investors rushed into bonds, driving the yield on the 10-year Treasury to 2.48% at one point, the lowest level since Oct. 2013. Bond yields fall when prices rise. The selling adds to Wednesday's losses, and marks a significant shift from the recent trend. The Dow has hit a string of record closing levels this week, and the S&P 500 crossed the 1,900 mark for the first time on Tuesday. It closed today at 1,871. There was no specific trigger for the retreat, said Bernard Kavanagh, a portfolio manager at Stifel Nicolaus. He said investors have been on the lookout for a pullback this year and many are primed to sell stocks at the slightest hint of bad news. "It's more sentiment driven than anything else," he said. "People are feeling skittish after we hit all-time highs just a few days ago." CNNMoney's Fear & Greed index fell back to a level signaling "extreme fear" in the market. Some traders pointed to comments by David Tepper, a widely followed hedge fund manager, who said Wednesday that he's "nervous" about the market. "The tipping point today was David Tepper's comments, which were seen as a siren song. Investors circled the wagon around that," said Mark Luschini, chief investment strategist at Janney. European markets were also under pressure following mixed economic data from the eurozone. Stocks in Italy, Ireland and Spain fell sharply. Germany and France both ended down 1%. The jitters were evident on StockTwits, where traders seemed particularly worried about small-cap stocks. The iShares IWM (IWM) exchange traded fund, which tracks a basket of 2,000 small companies, is down more than 10% from its most recent high, which meets the standard definition of a correction. "$SPY $IWM crash risk is high, need to stay alert," said slowslimslider. Traders were also sounding alarm bells about the broader market as well. 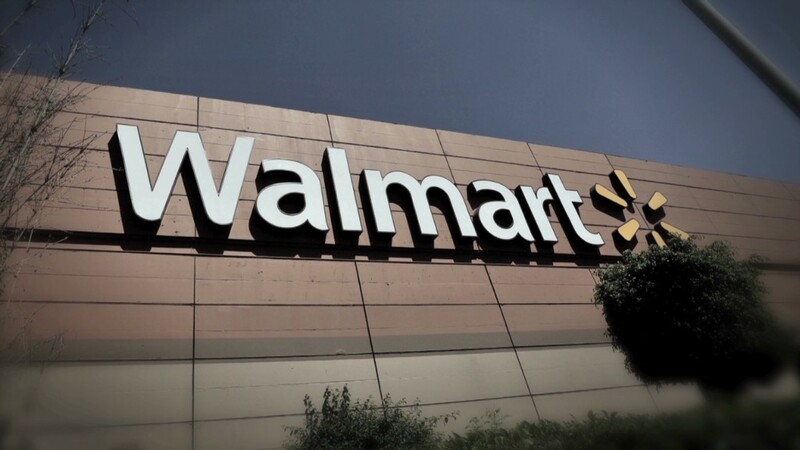 Investors were rattled by poor earnings and sales data from Wal-Mart. (WMT) The big discount retailer said its results were hurt by bad weather and a delay in tax refunds caused by last fall's government shutdown. Kohl's (KSS) also had bad news. The department store chain said sales fell 3.4% in the first quarter, missing the company's own expectations. But investors cheered J.C. Penney's (JCP) latest report, which came out after the market closed. The struggling retailer said it had sales of $2.8 billion in the first quarter, surpassing analysts' expectations. It also reported a smaller than expected loss. The stock surged nearly 10% in extended trading. "Cotton Dockers for everyone! $JCP," said chicagosean. General Motors (GM) announced five new recalls covering 2.7 million vehicles, including a wiring flaw tied to 13 accidents and two injuries. It was the latest in a string of high-profile recalls this year that have hit the automaker's bottom line. The stock ended the day down over 1.5%. The technology sector was a bright spot in early trading Thursday. Cisco Systems (CSCO) shares rallied more than 7% after the maker of information technology equipment and software reported earnings that beat expectations last night. On the economic front, the government said new claims for unemployment benefits fell in the week ending May 10. As expected, consumer prices increased 0.3% in April. Excluding food and energy prices, the consumer price index rose 0.2% last month. The Federal Reserve said industrial production fell 0.6% in April, surprising economists who were expecting no change. A report on manufacturing activity in the New York area came in above expectations, while activity in the Philadelphia region slowed. Federal Reserve chair Janet Yellen will be speaking about small business and the economy during a talk in Washington this evening. Asian markets had a mixed day. Investors in Japan pushed the Nikkei lower, shrugging off an impressive report on strong economic growth in the first quarter.